STOLL has been participating in ITM for many years and says it is the best platform in Turkey to show new technologies to existing and potential new customers. The booth was very well received by the visitors and everybody marveled the joint booth from STOLL, Mayer Mümessillik and Mayer & Cie. "STOLL is always a highlight", has been the tenor of the visitors. 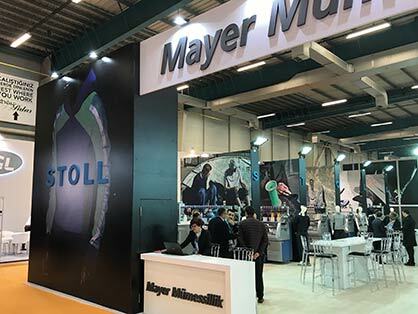 Together with their agency Mayer Mümessillik STOLL exhibited the latest technologies. During the 4 days of the exhibition the booth was always very well visited and customers from Turkey, Russia, Kyrgyzstan, Uzbekistan, Iran, Saudi Arabia and Africa found their way to the flat knitting machine manufacturer..
On this exhibition STOLL presented a large variety of their flat knitting technologies such as the well-known ADF machines with all kind of plating possibilities combined with intarsia and weave-in technology, as well as other flat knitting machines offering many different fields of application. For example they exhibited a machine knitting medical textiles. Another highlight was the CMS 502 HP+ which was knitting a traditional kelim-design. The famous subject of knitting shoe uppers is now becoming a more and more important field of application in Turkey. STOLL had several shoe uppers on display which found great interest for their customers. Stoll says they hope Turkey will get its well-deserved share in this market soon. "Each day we had lots of very promising discussions with existing and new customers. Some of these discussions have led to significant business deals. 2018 looks to become one of the most successful years for STOLL in this market", a STOLL speaker says. 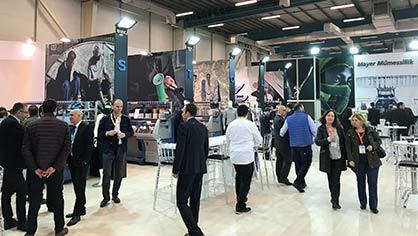 Finally STOLL is very satisfied and happy with their participation in ITM 2018 and look already forward to the next one.